When I started this blog I only knew I loved planning and creating tablescapes. I didn't know very much about china (other than what I liked and disliked); crystal was merely table jewelry to me, and I knew NOTHING about linens (who knew Ralph Lauren designed table linens?!) But, since I have entered the blogosphere and enjoyed the tables of so many talented tablescapers, I find that some names are becoming familiar to me and a whole new knowledge base is finding its way into my awareness. One designer who has captured my interest is April Cornell. 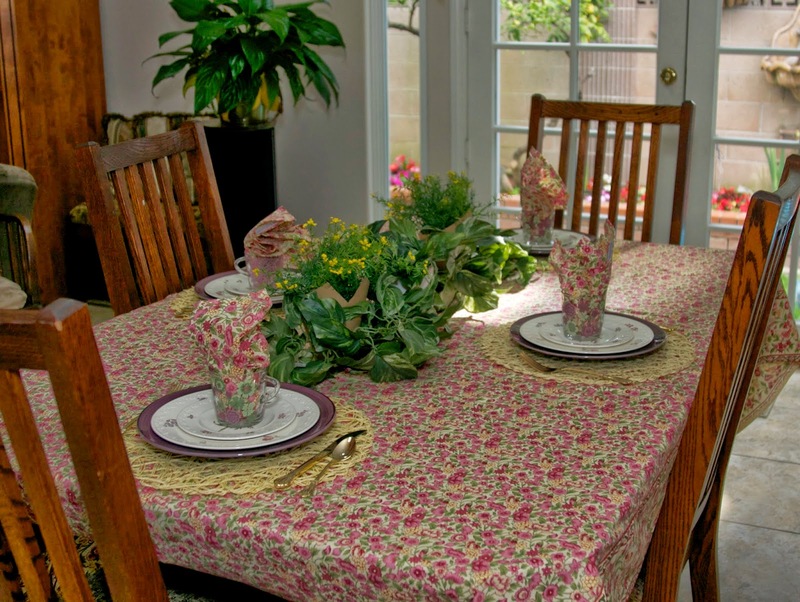 I absolutely love her brightly colored tablecloths, napkins and placemats. They are perfect for setting a table that speaks of light, happy meals and welcomes the smiles that come with the experience of a shared occasion around the family table. So, this post will honor the talent and design colors of April Cornell. Actually, this post honors other things relating to April, as well. First of all, this April finds my oldest daughter celebrating her 40th Birthday! It is also the birthday of my youngest granddaughter who will be four!! My stepdaughter has an April birthday, as well as a dear cousin, whose name I carry. And, then, the end of April is the due date for my second daughter's first child ( and I will once again have a baby granddaughter to snuggle!) So, this post is a salute to April, and all it means to me this year!! 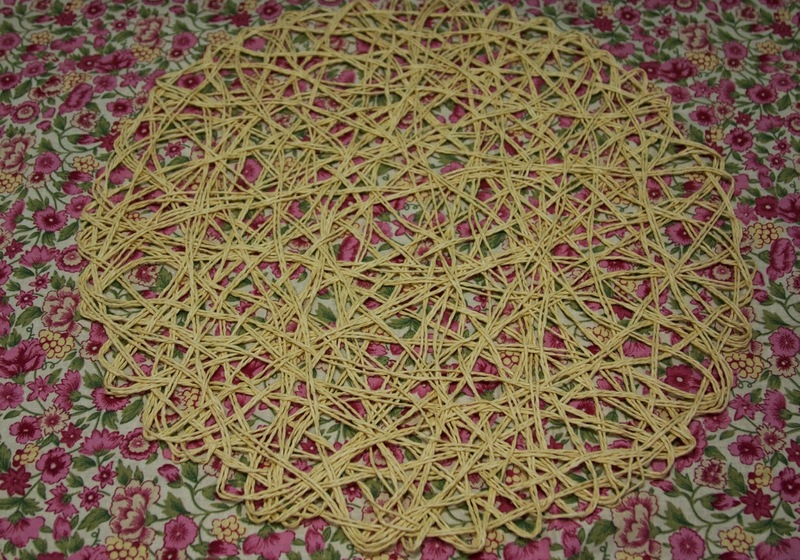 I started with the April Cornell tablecloth I found at HomeGoods. 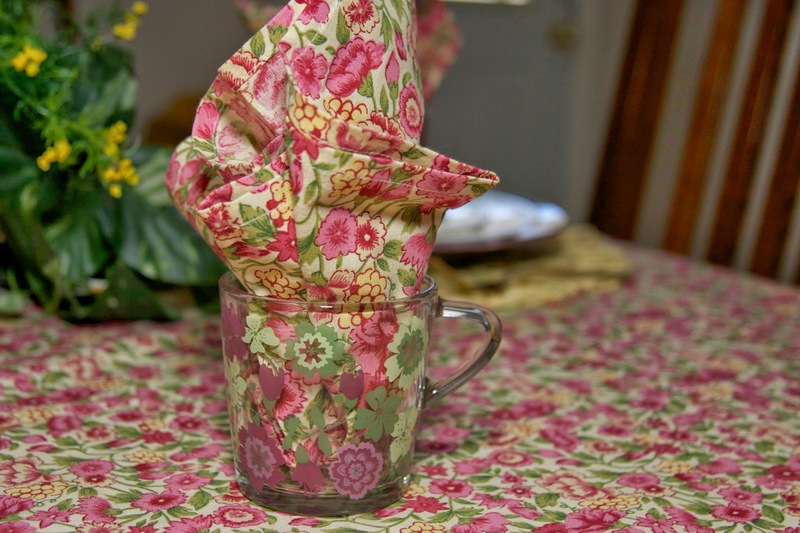 I not only love the vibrant spring colors, but the pattern and precious edging on the cloth. There were many colors to choose from, but I decided to use yellow as the accent color. So, I started with my placemats from Bed, Bath and Beyond. I first tried a green plate, then a yellow plate, and then switched my whole plan and went with purple! I just decided to celebrate color today! 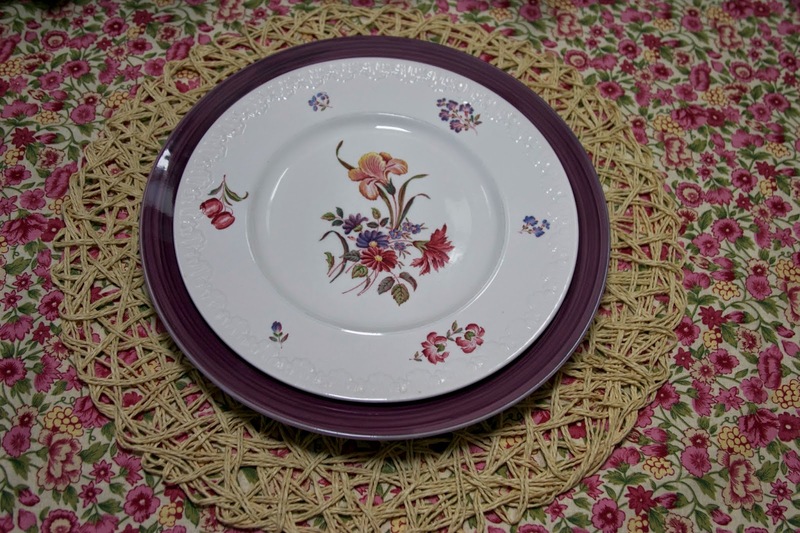 These plates were found at Anna's Linens and are marked Gallery: Margarita. The next layer is the dinner plate that I have shared in a previous post: It is English china, labeled Cotswold. I love the way the purple in the dish pops with the purple dish underneath it. 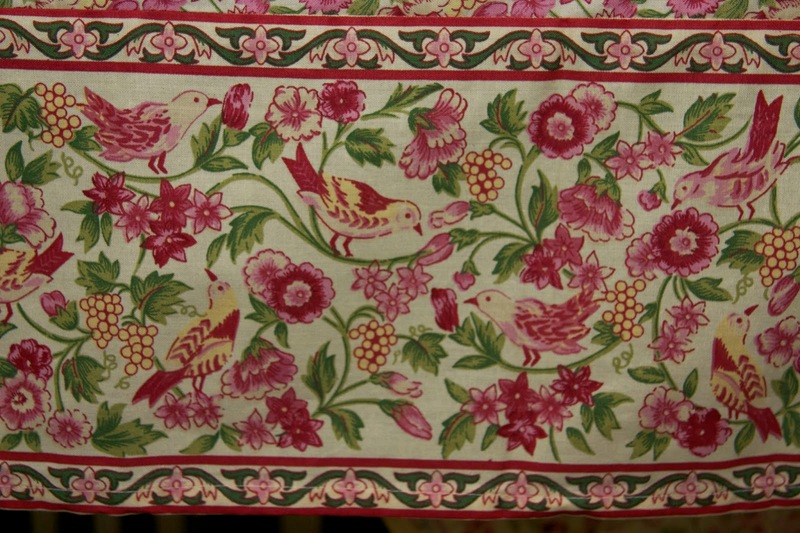 I also llike the floral pattern on the plate against the flowers on the April Cornell tablecloth. Next is the salad plate to the Coswold set. The table setting is completed with gold flatware on loan from my cousin, glass mugs that I found at Ikea (absolutely cannot believe how well the pattern on the mugs matched the tablecloth! It's like they were designed together!) and the April Cornell napkins. The centerpiece is simple. I begin with a precious vase I first introduced in this post. Its colors work perfectly with this tablecloth. 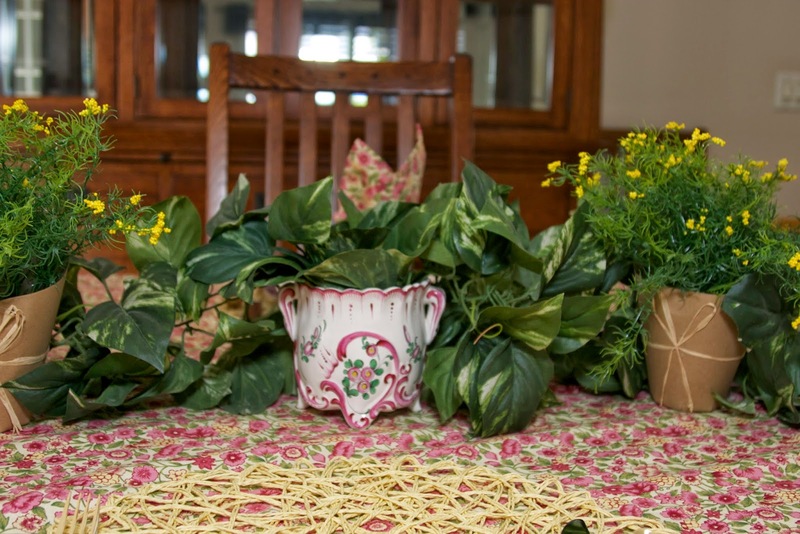 I added a faux garland of leaves and two brown paper vases filled with faux dainty daisies from Michael's. So, let's salute April!! Let's salute the wonderful colors and designs of April Cornell. Let's salute the birthdays of Lisa, Lucy, Tori and Rosemary. And let's salute the birth of Laura's baby girl, another precious addition to our family, who will one day have a place at our family's table, no doubt decorated with one of Gramma's tablescapes!! 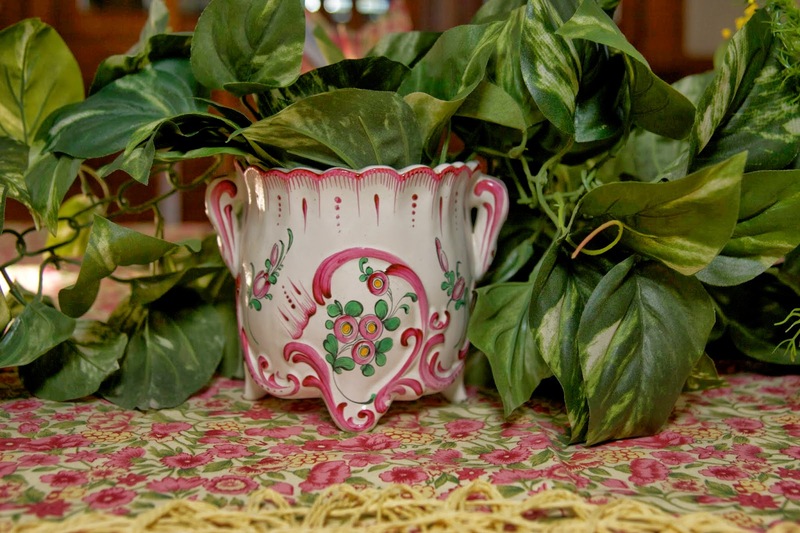 I'll be linking up to Susan's Tablescape Thursday at www.betweennapsontheporch.net. Thank you, Susan for hosting!! I love to read your comments: they are truly appreciated!! If you'd like to become a follower, please go to the top of my blog, add your email where it says, "Follow by Email" and hit "Submit". AC linens are always beautiful! 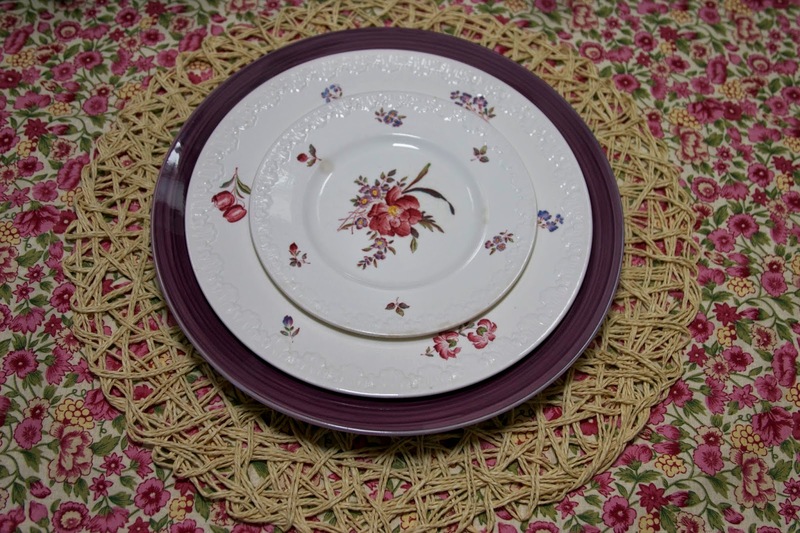 Great choice for china to go with your linens. I really like the centerpiece...makes it feel like spring. Have a great week, Rosie. I love the purple plates with your table cloth and napkins. I think it's a perfect choice with the yellow place mats. The yellow flower arrangement is the perfect touch, too. Your table is very fresh and Spring-y and lovely all around! 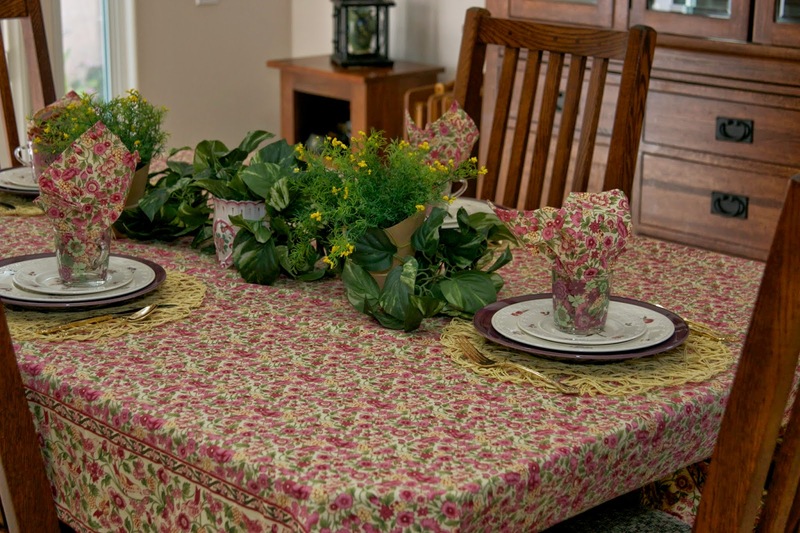 What a great table setting to celebrate all the ladies in your family with special times of joy in April! The colors are great and the tablecloth pattern is joyful in and of itself! You can't help but to feel happy when that happy design comes into your sight line! 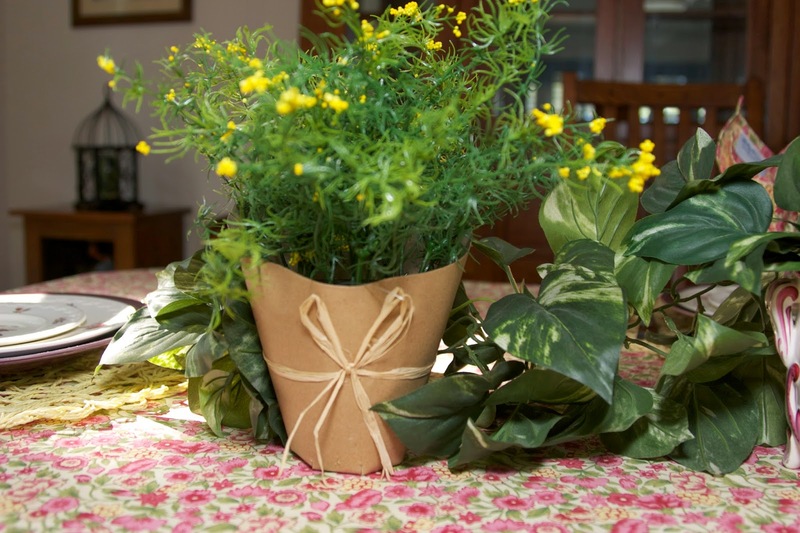 I saw those fun brown paper-wrapped flowers at Michael's. I should have bought some, but somehow I resisted. You made them look really cute here nestled in with all the greenery. Lovely AC linens, they are so pretty with your china and the charger and the rattan placemats. Bless your heart! Another Grand Daughter! Congratulations! 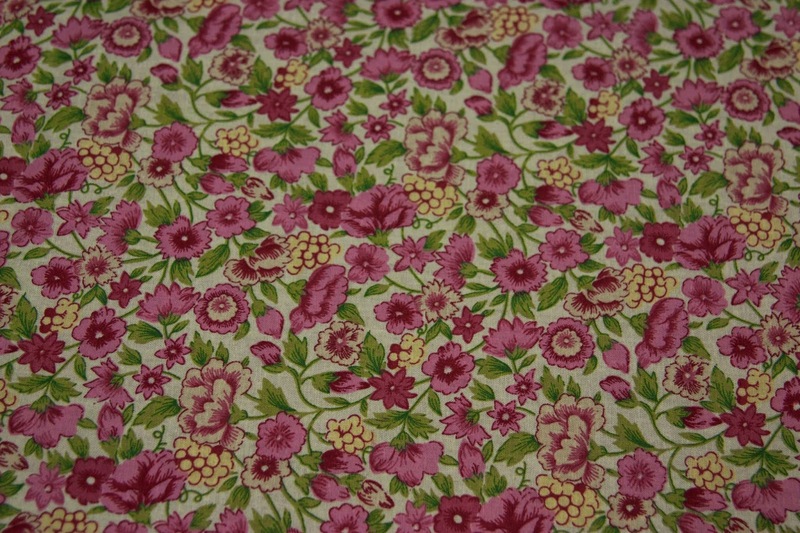 Beautiful table...totally coveting this tablecloth! I love April Cornell fabrics. I have had a dress and a skirt from her catalog, so soft and beautiful. Everything looks so beautiful together, Rosie. I think you made the right choice with those purple plates, too, and you're right, those glasses are perfect. Blessings to you and for all the celebrations at your house! Glad to find your blog! You've got some really pretty things posted here! Love the April Cornell things, and that little vase is perfect with it! 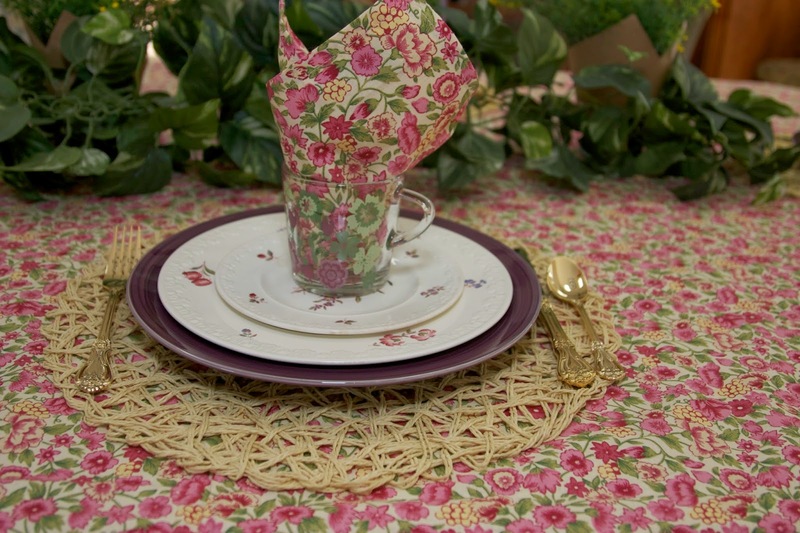 What a pretty table and tablecloth! 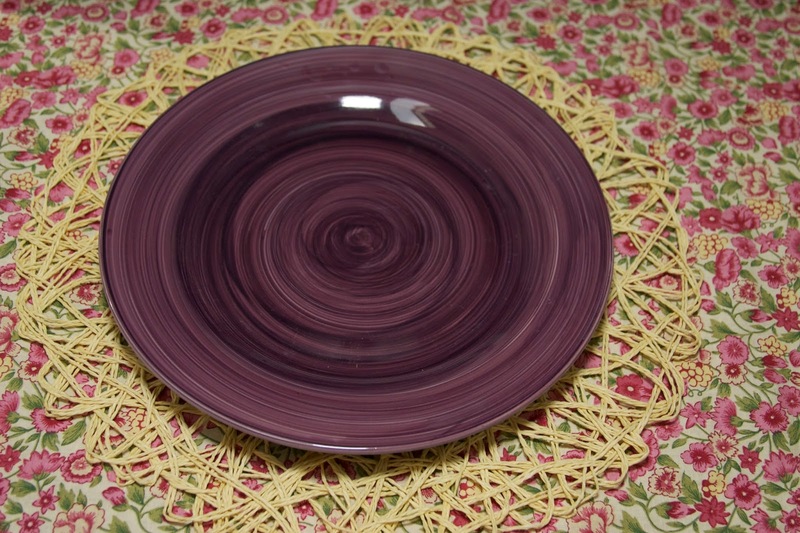 The plum colored plate is the perfect touch! What a busy April you are having - lots of blessings! I love April Cornell fabrics too and found out in France that those fabric borders are very traditional in Provencal linens. I especially love how the white in the vase and the plates calm down the pink profusion of the floral tablescape. Beautiful! So pretty! You have a lot of wonderful things going on in April, send my best for all!